MacConkey Agar is used for the isolation and differentiation of Gram-negative enteric bacilli. Conforms to Harmonized USP/EP/JP (United States, European, Japanese Pharmacopoeia) Requirements. MacConkey Agar is based on the bile salt-neutral red-lactose agar of MacConkey. The original MacConkey medium was used to differentiate strains of Salmonella typhosa from members of the coliform group. Formula modifications improved the growth of Shigella and Salmonella strains. These modifications include the addition of 0.5% sodium chloride, decreased agar content, altered bile salts, and neutral red concentrations. The formula modifications improved differential reactions between enteric pathogens and coliforms. MacConkey Agar is recommended for the detection and isolation of Gram-negative organisms from clinical, dairy, food, water, pharmaceutical, and industrial sources. MacConkey Broth conforms to Harmonized United States Pharmacopoeia (USP), European Pharmacopoeia (EU), and Japanese Pharmacopoeia (JP). Enzymatic Digest of Gelatin, Enzymatic Digest of Casein, and Enzymatic Digest of Animal Tissue are the nitrogen and vitamin sources in MacConkey Agar. Lactose is the fermentable carbohydrate. During Lactose fermentation a local pH drop around the colony causes a color change in the pH indicator, Neutral Red, and bile precipitation. Bile Salts Mixture and Crystal Violet are the selective agents, inhibiting Gram-positive cocci and allowing Gram-negative organisms to grow. Sodium Chloride maintains the osmotic environment. Agar is the solidifying agent. The formula may be adjusted and/or supplemented as required to meet performance specifications. 2. IRRITANT. Irritating to eyes, respiratory system, and skin. 1. Suspend 50 g of the medium in one liter of purified water. 2. Heat with frequent agitation and boil for one minute to completely dissolve the medium. 3. Autoclave at 121 degree Celsius for 15 minutes. Dehydrated Appearance: Powder is homogeneous, free-flowing, and light pink-beige. 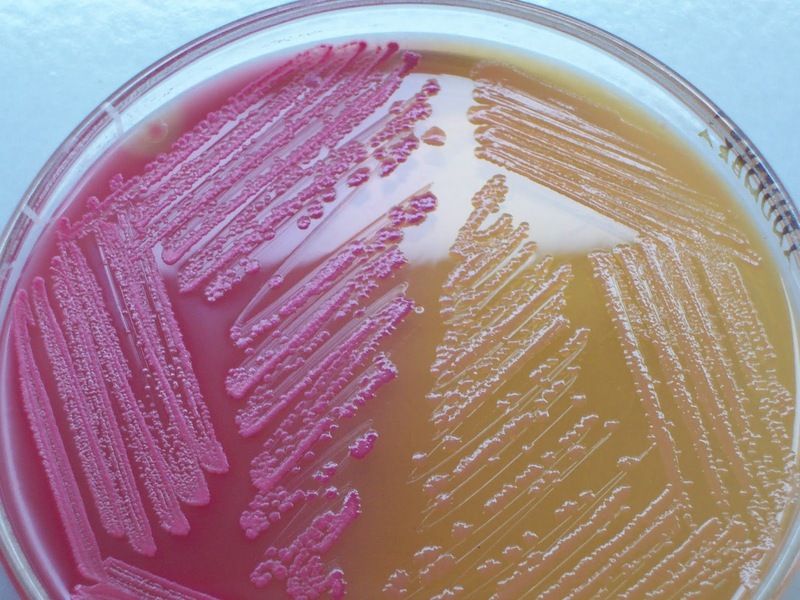 Prepared Appearance: Prepared MacConkey Agar is medium to dark pink-purple and trace to slightly hazy. Expected Cultural Response: Cultural response on MacConkey Agar tested at Harmonized USP/EP/JP specified temperatures and incubation times. Refer to appropriate references using MacConkey Agar for the isolation and identification of enteric organisms. Lactose-fermenting organisms grow as pink colonies with or without a zone of precipitated bile. Non-lactose fermenting organisms grow as colorless or clear colonies. Store dehydrated medium at 2 - 30C. Once opened and recapped, place container in a low humidity environment at the same storage temperature. Protect from moisture and light by keeping container tightly closed. Refer to expiration date stamped on the container. The dehydrated medium should be discarded if not free-flowing, or if appearance has changed from the original color. Expiry applies to medium in its intact container when stored as directed. 1. Some strains may be encountered that grow poorly or fail to grow on this medium. 2. Although MacConkey Agar is a selective medium primarily for Gram-negative enteric bacilli, biochemical and serological testing using pure cultures are recommended for complete identification. 3. Incubation of MacConkey Agar plates under increased CO2 has been reported to reduce growth and recovery of a number of strains of Gram-negative bacilli. 1. United States Pharmacopeial Convention. 2007. The United States Pharmacopeia, 31st ed., Amended Chapters 61, 62, 111. The United States Pharmacopeial Convention, Rockville, MD. 2. Directorate for the Quality of Medicines of the Council of Europe (EDQM). 2007. The European Pharmacopoeia, Amended Chapters 2.6.12, 2.6.13, 5.1.4, Council of Europe, 67075 Strasbourg Cedex, France. 3. Japanese Pharmacopoeia. 2007. Society of Japanese Pharmacopoeia. Amended Chapters 35.1, 35.2, 7. The Minister of Health, Labor, and Welfare. 5. Murray, P. R., E. J. Baron, M. A. Pfaller, F. C. Tenover, and R. H. Yolken (eds.). Manual of clinical microbiology, 6th ed. American Society for Microbiology, Washington, D.C.
6. Marshall, R. T. (ed.). Standard methods for the examination of dairy products, 16th ed. American Public Health Association, Washington, D.C.
8. Vanderzant, C., and D. F. Splittstoesser (eds.). 1992. Compendium of methods for the microbiological examination of food, 3rd ed. American Public Health Association, Washington, D.C.
9. Eaton, A. D., L. S. Clesceri, and A. E. Greenberg (eds.). 1995. Standard methods for the examination of water and wastewater, 19th ed. American Public Health Association, Washington, D.C.
10. Association of Official Analytical Chemists. 1995. Official methods of analysis of AOAC International, 16th ed. AOAC International. Arlington, VA.
11. Mazura-Reetz, G. T. Neblett, and J. M.Galperin. 1979. MacConkey Agar: CO2 vs. ambient incubation. Abst. Ann. Mtg. American Society for Microbiology. C179.